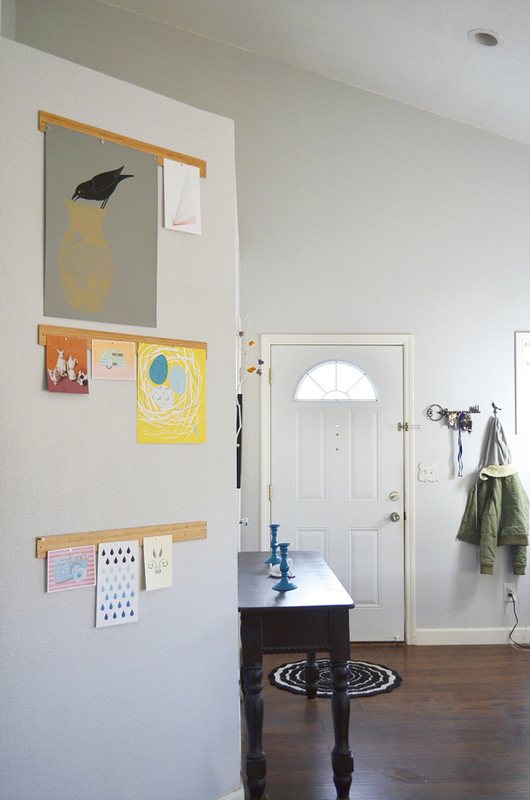 I've been wanting to try and non permanent way of hanging art and I was inspired by these two solutions. 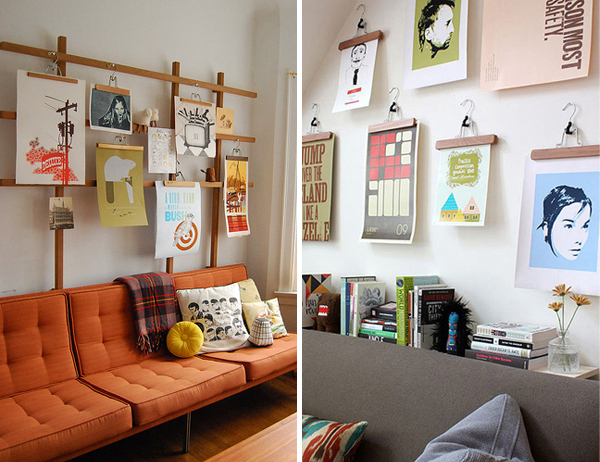 I love both of these ideas, but I couldn't really make them work in my house. I don't have a big enough wall behind the couch to create a structure like Ladies & Gentlemen Studio and I wanted to avoid making holes in the wall, like the example on the right. Holes are fine if you have the patience to patch them up when you change your mind about the location, but I don't have any patience, so I avoid holes all together. I typically use 3M Command Picture Hanging Strips to hang all my art (except for the very large stuff, I make holes for that kind of stuff). I still add a small nail for extra support, just in case, but the 3M strips have held up very well. I'm very happy with them. 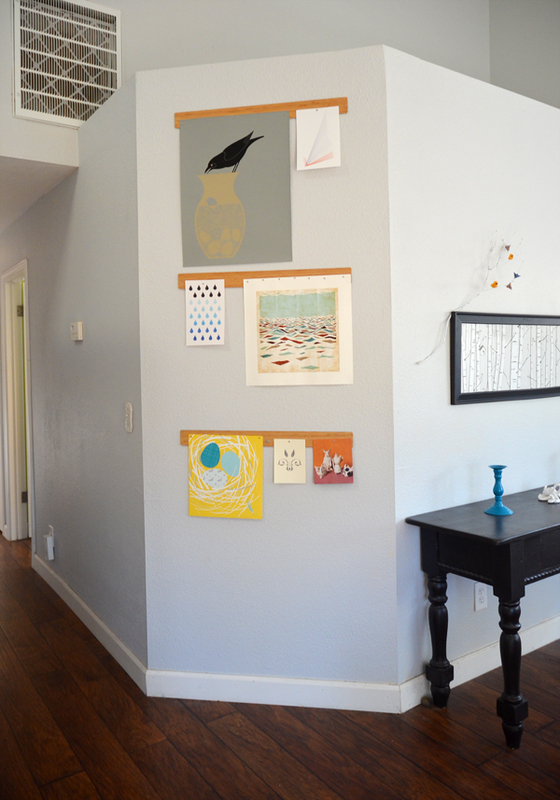 Here is a post from Apartment Therapy about those strips. 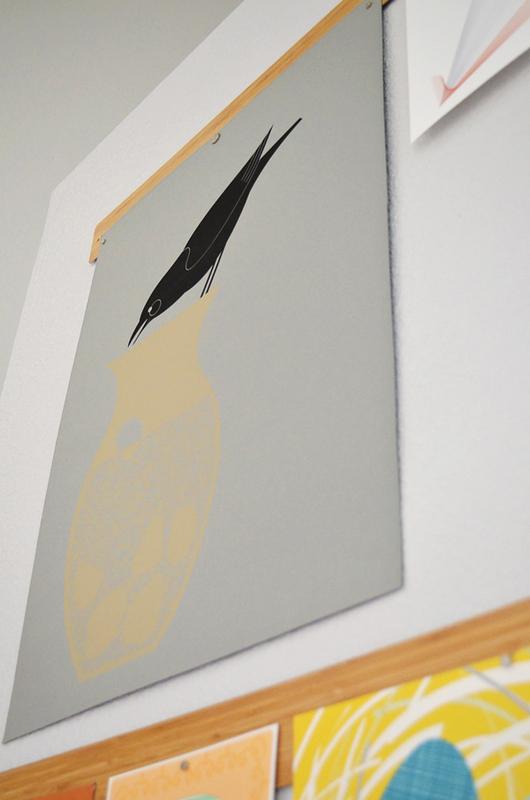 Anyhow, I really liked the idea of not having to go out and buy a frame for every piece of art. The more expensive stuff, that should be in a frame, but for most things, I don't think it's necessary. So I came up with this idea. A magnetic wood strip. I'm sure this can by DIYed, but I just bought mine from the Container Store on sale for $9.99. 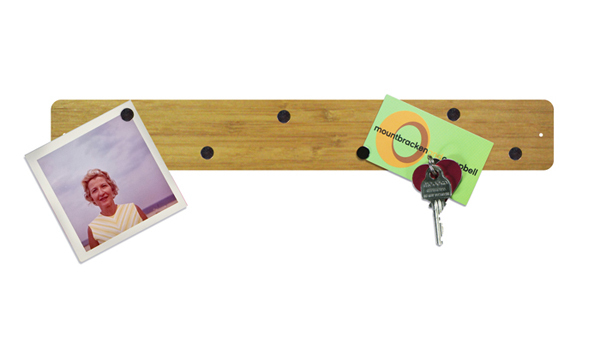 They're called Woodnetic, magnetic wood strip bulletin board. The bamboo one's aren't on their online store for some reason, but they usually have them in the store. I bought 3 of them and stacked them using the 3M strips, instead of the screws they came with. I've already changed up the art a few times. I'm still wondering if I like the hangers better, but we'll see. Who knows, I might change my mind again in a month. What do you guys think?